For Insulation Tax Credit click here. Attic Insulation Tax Credit for your Michigan home. Kincaide Construction only uses quality products which are 100% white loose fill fiberglass insulation and Heatbloc-ULTRA, a new and improved innovative radiant barrier which can reflect up to 81% of the radiant heat caused by the sun. This will reduce your attic temperature up to 30 plus degrees. And we all know if you can keep your attic cooler, you can keep your home cooler. 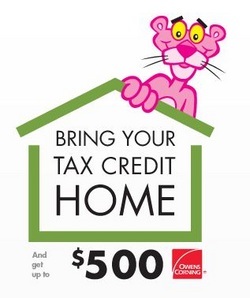 Call today to get up to $500 tax credit, and also save up to 30% on energy bills. Michigan Insulation contractors of Fiberglass in Detroit.